Based on the novel by Thomas Pynchon (which I have only had time to read about a chapter of, and am now guaranteed to finish the first chance I get), Inherent Vice is built around the kind of narrative that must be experienced, rather than explained. Set in Los Angeles in 1970, it starts with stoner private eye ‘Doc’ Sportello getting an unexpected visit from his ‘ex old-lady,’ Shasta, at his beachfront house. She’s worried that her current boyfriend, a billionaire land developer, is the target of a plot by his wife, and his wife’s boyfriend, to get him kidnapped and thrown into a mental hospital, all so they can…well, actually, I’m not so sure what their plan is. This is the point where the plot synopsis included with the screener gives up too. It also only encompasses a fraction of exposition from the first seven minutes of the movie. So yeah – if you’re looking for a plot that’s easy to follow, or can be concretely pieced together in a single viewing, look somewhere else. 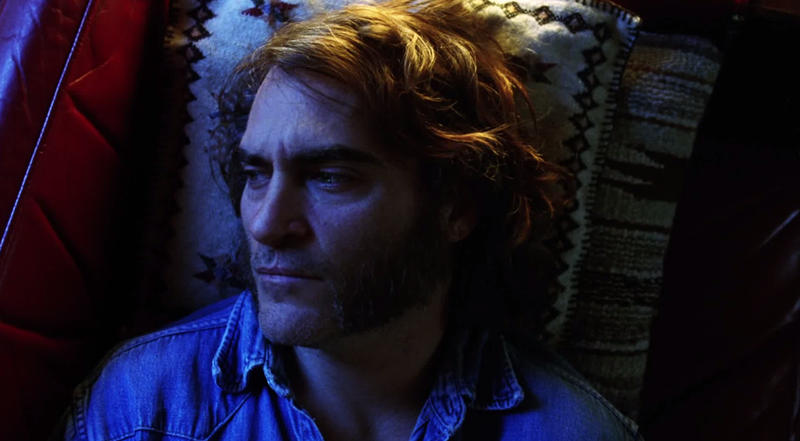 That’s not what Inherent Vice is about, and God bless it for it, because the endlessly complicated yarn that unspools from there – about corrupt land development, a mysterious drug syndicate run by dentists, an undercover saxophone player with ties to stoners, Nixon, and Nazis, and a dozen other things I’m probably forgetting about – is as riveting as it is disorienting. 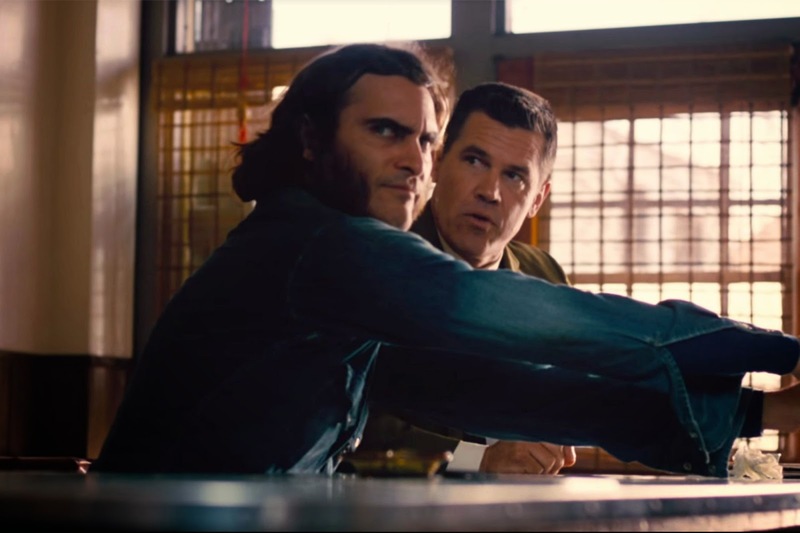 Inherent Vice is dense and novelistic, structured with all the usual twists, turns, and revelations of great detective fiction, and part of the fun lies in watching the movie undercut those familiar structural conventions, over and over again. Every time Doc gets a big lead, or uncovers some obviously significant clue – those moments in a mystery where things theoretically come into focus – the picture just gets fuzzier, for both Doc and the viewer. It’s this constant sense of ‘Aha! That means something…but what?’ And in the drug-fueled context of 1970 Los Angeles, in the midst of the weird, wonderful world Anderson has created, that isn’t frustrating, but enthralling. It helps, of course, that Doc himself is such a superb character creation, an audience avatar who is a compelling, lovable figure in his own right, played to absolute perfection by the incomparable Joaquin Phoenix. After returning to acting with Anderson’s last film, The Master, Phoenix has just gotten better and better, and what I especially love about this phase of his career is the vulnerable, deeply human center at play in his work, this wounded puppy dog sensibility that makes him an intensely empathetic performer. He plays Doc as a good, thoroughly decent guy, a smart and committed detective trying to make sense of this increasingly strange world he inhabits. Doc’s own drug use, mostly restricted to pot, gives him a certain baseline haze at all times, but the stuff he’s dealing with throughout this story gets a whole lot weirder than any chemically altered state, and Phoenix is just fantastic at illustrating every step in that journey. It’s a reactive piece of acting, in many ways, fueled by narrative circumstance and by the many characters he comes in contact with, and one of the supreme pleasures of the film lies in seeing Phoenix play off the laundry list of great performers in the ensemble. For a while, the film is a series of acting duets between Phoenix and other actors – Katherine Waterston, Josh Brolin, Owen Wilson, Benicio Del Toro, Reese Witherspoon, Jena Malone, and countless others – and Anderson wisely lets their encounters linger, capturing the unique energy of every pairing (and the poetic, off-kilter dialogue they have to recite) in superbly composed long takes. The acting is so tremendous across the board, and Phoenix has such weird, delightful chemistry with everyone, that I found myself giggling my way through scenes just from the sheer euphoric pleasure of watching it all unfold. That’s not the only reason to laugh, of course, as Inherent Vice is a deeply funny film, one with a truly deranged, charmingly bizarre sense of humor. Anderson just peppers jokes in throughout, usually as these little grace notes in the middle of otherwise ‘serious’ (or, as ‘serious’ as this movie gets) scenes. Physical gags, baffling word combinations, surreal interludes…all are deeply funny, and each come completely out of left-field, creating this palpably odd energy that is its own kind of high. Josh Brolin, for instance, is just demented in this film, introduced wearing the familiar, uptight veneer we’ve seen him play in other roles, before layering several coats of insanity on top. He’s genuinely hysterical, as are so many others in the film (Phoenix’s commitment to some of the physical comedy verges on Chaplin-esque), and I was cackling uncontrollably for a good deal of the run-time. Anderson has a lot more on his mind than laughs and narrative subversion, though, and as the drug use, screeds against hippies, references to the Manson family, and hints at conspiracy continue to pile up, it becomes clear that the film has something to say about counterculture and the order of American power. The narrative, whatever it means, is like the ultimate hippie paranoia fantasy (in part because the ‘conspiracy’ can never be nailed down exactly), and the film taps into a genuine sense of pain, fear, and confusion that existed not only in the 1970s, but is obviously still at work today. I think the film really kicks into a higher gear in the last half-hour or so, as the damaged, bruised heart beneath these characters and their world is gradually revealed. Anderson pushes things to be increasingly obscure and opaque, in his characteristic way, and as he does, the emotions lying underneath this story become more and more palpable. Katherine Waterston has a stand-out scene opposite Phoenix late in the film, which is at once the film’s most incomprehensible and most profound moment, and as much time as one spends riding the sheer chemical high the film creates, Anderson ultimately leaves us with something deeper – something I cannot quite put into words, but which involves the way we flee from pain, or internalize confusion as a way of shielding ourselves from the world’s incomprehensibility, or live in altered states (drug-induced or otherwise) to deal with our own ‘inherent vice’ – our own irreparable instability. I doubt a full reading of this film could possibly emerge any time soon, but it seems clear to me that Anderson has crafted something vast and significant, a film designed to reward deeper engagement at every possible level. For instance: I might have to sit down and play the film on mute one of these days, because the succession of imagery captured by DP Robert Elswit is just stunning. For my money, no film this year has made better use of color and lighting; the sun-kissed oranges and deep, rich blues used to illustrate Doc’s world are eye candy of the highest order, and every composition is a feast of location- and period-specific detail. Weathered and lived in, this is one of the most exquisitely mounted productions of the year (only Wes Anderson’s The Grand Budapest Hotel could top it for Design and Art Direction), like stepping into a time machine and winding up on the beaches of LA 44 years ago. Elswit’s grainy, intensely filmic photography is a perfect match for the material, and it amazes me that the same cinematographer could shoot this and Nightcrawler in the same year, two of the best cinematic portraits of Los Angeles the medium has ever received. Composer Jonny Greenwood, in his third collaboration with Anderson, also hits it out of the park, delivering a dense and idiosyncratic score that is a lovely enigma in its own right, evolving into a totally different presence every time it appears. Here’s one way I know I truly like a film – when I get to the end of a review, and find myself smiling, so happy to be talking about it, excited to jump back into the film’s world as soon as possible. If a film can stand up to that kind of scrutiny and only seem all the more impressive, it’s a winner, and writing about Inherent Vice only convinces me of its worth further. I feel like this film is going to be a classic, a work I and, I assume, many others shall happily revisit and reevaluate for many years to come. As much as any other film I’ve seen this year, Inherent Vice has staying power; that it boasts as many cinematic riches in a single frame as some perfectly decent films do in an entire run-time may push it near the top of this year’s pack. Inherent Vice opens in New York and Los Angeles this Friday, December 12th, expanding over the following weeks before opening wide on January 9th.